By Jake Rocheleau in Internet. Updated on April 26, 2018 . Along with all of the collective Google apps, Contacts has proven to be a very dynamic address book system. What first started off in GMail has now adapted into its own web-based application in which you can add, edit, delete, and categorize your Google Contacts. These lists can sync with your Android phone or even with your iPhone / OS X Contacts list — if you can set it up properly. Thus it is crucial to keep these contacts organized and easy to flip through. Unfortunately Google is far from being the best housekeeper, and the development platform is still in its infancy. I have added some helpful tips below for Google users to organize their enormous Contacts list. If you started out using GMail then you’ve likely got a very large Contacts list. Within the default All Contacts menu is a list of every person you’ve ever emailed, replied to, or called or texted through Google Voice. It also holds the contacts who has ever messaged you via Google Chat. It is nice that Google has provided several default categories to start with. You can organize family members and friends into their own groups, but this may seem a bit awkward since Google+ uses Circles now. The easiest way to manage and set up duplicate contacts is through your Google+ profile, if you are a user. Otherwise you may want to split the contacts for business from those for personal use. You can create new groups at in the sidebar link under the label “New Group”. All new groups are stored under “My Contacts” which is the master group you can’t delete. As difficult as it sounds, the most reliable way to organize all your contacts is to manually go through the Other Contacts group. I’ve had my Google account for about 5 years now, and currently my Other Contacts group holds just over 6,000 people. Many of these are blank e-mail addresses I’ve communicated with in the past. If you don’t want to manage database this size, then just organize the people you do know into My Contacts. This can then be your go-to folder for contacts since it is this folder that will sync with any paired Android mobile device. To add contacts into GTalk, you first have to send out a chat request to somebody, or accept their requests to chat to you. Afterwards they’ll be automatically added into the My Contacts group. This process also attaches their first and last names in the contact display. 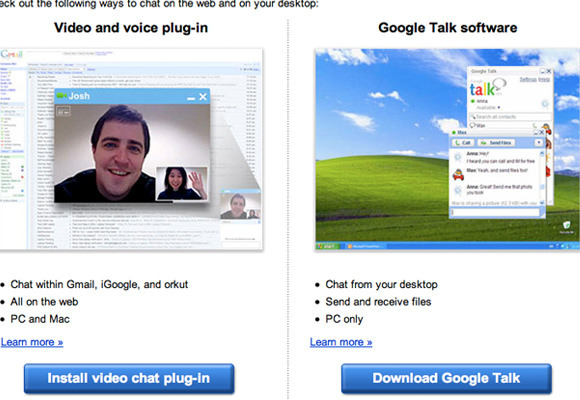 Now one issue I’ve run into when using GTalk is on the Windows desktop application. When you first download Google Talk and log in, you’ll be presented with your normal buddies list. This includes everybody online, idle, and offline. The problem with that is that it also includes all the contacts you have which are not part of Chat; instead, it pulls data from your All Contacts group. For me, this means over 5000 people and e-mail addresses which I don’t care about and many of whom aren’t even using chat is in my GTalk. To disable this feature, look towards the bottom of the app for a “View” button. 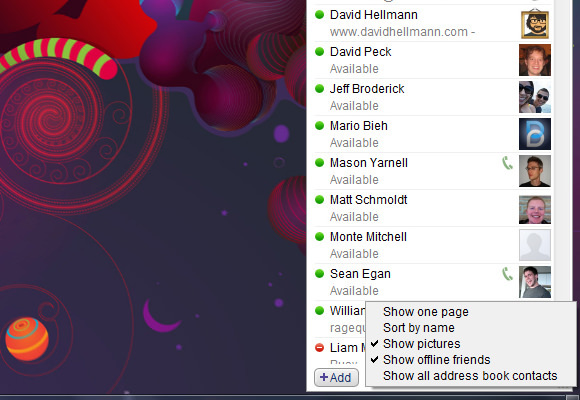 Click once to open a menu and look for “Show all address book contacts”. This has a check mark by default, meaning it’s enabled. Just click once to disable and you’ll notice a drastic clearing out of your Chat list. 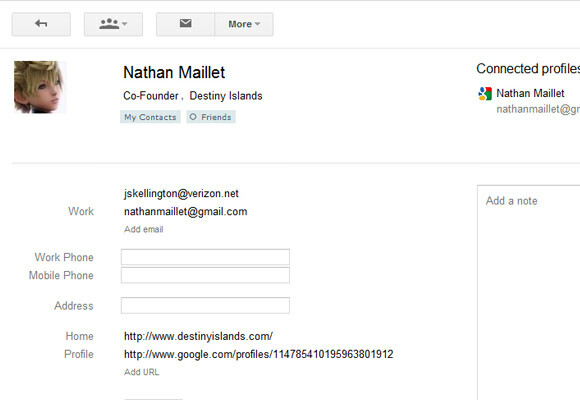 The new and refreshed layout for Google Contacts reflects many of their recent design schemes. It looks very much like Google Docs and also behaves in a similar function as the newer GMail. All down the main column you’ll find default Contacts listed with their full name, email address, phone number, and other details. From the left sidebar you can flip through other Contact Groups and even look through Google+. If you are not using their social networking features then this list will be empty. 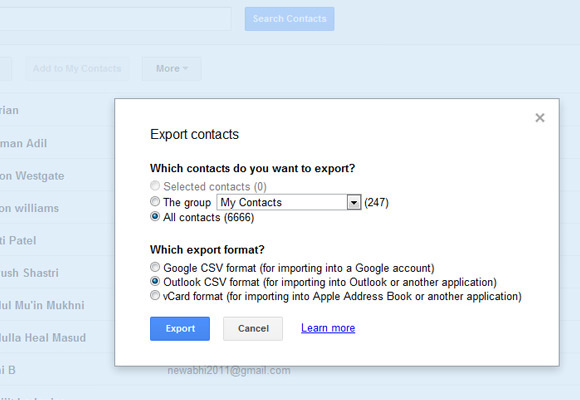 From the Import link you can add any CSV file or a vCard for any alternate contacts. The main top menu has some additional features, and it also lets you directly add a new contact. You can flip through multiple pages from the buttons on the right-hand side. Additionally in the gear menu you’ll find a Settings link. This menu displays inputs to increase the contacts listing up to 500 per page and additionally toggle keyboard shortcuts on and off. You can get a full list of keyboard shortcuts from Google’s support center. From the main contacts view you can click on any user row to open up a more detailed view. At the top you’ll find the contact’s name, profile photo, job title, company, along with the groups and circles you have them in. In the screenshot below you can see that my friend Nathan’s contact is saved in My Contacts and the “Friends” circle in my Google+. Much of all this data can be pulled from the other contact’s Google account, assuming they’ve filled in the respective fields. However you can also manually edit the contact details yourself i.e. multiple phone numbers, e-mail address or webpage URLs. Google even gives you sub-categories such as Blog, Home Page, and Profile. The large text area on the right has the placeholder text “Add a note”. None of this information is displayed publicly or shared with your contact. I personally have never felt the need to use this section. But it is a great place to store extra meta information you don’t want to forget about a contact. This could be memorable dates such as anniversaries, yearly get-togethers, or an upcoming appointment or meeting. This is one function that is missing from other mainstream contact books. 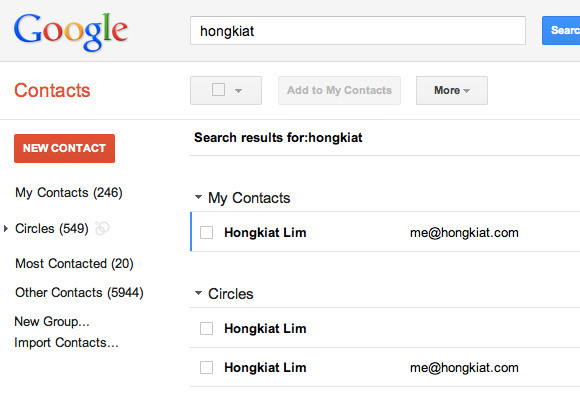 From any Google Contacts list view click on the "More button" to display extra options. Then click on the “Find & Merge Duplicates” link. If nothing can be found you’ll get a small popup message clarifying you have no duplicates. 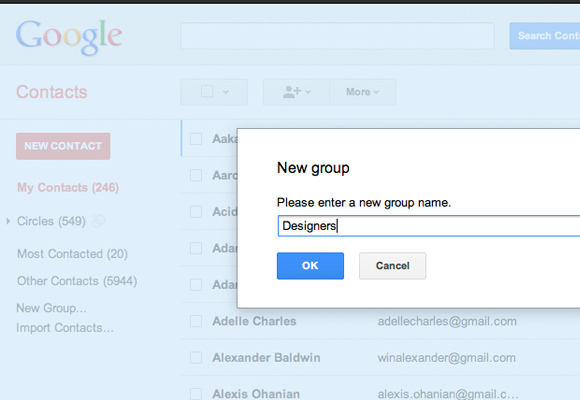 Otherwise Google will bring up a small list of contacts which have repeat entries in multiple group lists. Most commonly, I find duplicates between my main contacts and my Google+ circles. If you wish to keep these separate that shouldn’t be a problem either. But to my knowledge merging both listings shouldn’t affect anything outside of Contacts. If you don’t have the time to go through all your groups and delete unnecessary entries, the export feature may be the quickest solution. Click the "More" button menu and select the “Export” link to bring up a new window. From here you can select the group you wish to target (I’ve chosen All Contacts) along with the output format. vCard listings are a bit more difficult to weed through. The .CSV file for Outlook or similar Microsoft products should open properly in Excel. From here you can go through all of the rows and even delete large blocks of contacts at once. This makes clearing out your list a lot easier than trying to work within the 500 page limit in the contacts manager. 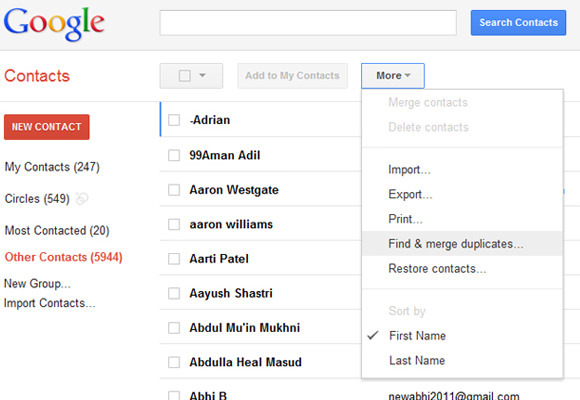 Once you are finished with the organizing activity, just save the file and re-import into Google Contacts. I recommend saving this copy under a different filename so you don’t overwrite the original list. just in case. The new in-browser chat app is featured both in GMail and Google+. 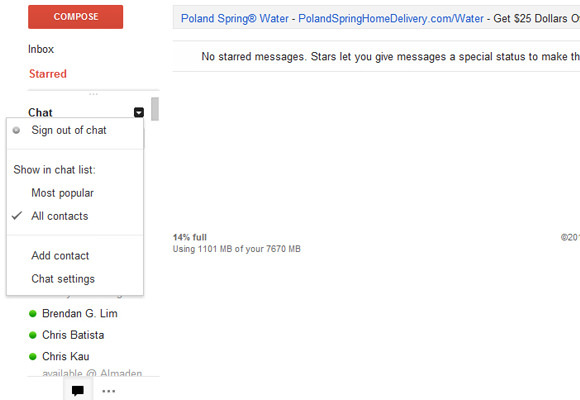 The functionality is much more refined within GMail, so it’s a lot easier to play around with your chat contacts. I’ve turned off my chat client on G+ as I often feel that G+ is a bit too much to deal with. If you are already logged out just click the sign in link towards the top of the widget. If you can’t find chat just click on the speech bubble icon towards the bottom of your left column. If you hover in this chat widget area you’ll notice a new dropdown menu link appear in the top right. One of the settings is labelled “Show in chat list”. By default it only displays "Most Popular" contacts, which can be annoying since you can’t see who else is online. I always change this to All contacts so I can access my whole chat list. It’s worthy to note that this All contacts is NOT the same as your “All Contacts” group. Instead it just displays all contacts authorized to chat with you. If you hover over your contacts in the chat list you’ll see a small side pop-up window with their profile picture, name and email. This menu does not appear in the Google+ chat list – yet another reason to stick to GMail. Now the best way to organize your contacts is to search in the box right above your chat status. As you type, Google will offer suggestions of people and you can choose to add them to your chat list, send them an e-mail, or even block them. If the person is in your chat list already they will have a small notification icon to the left of their name. The green bubble means they’re currently online, red means busy, amber means idle and grey means offline. Based on this interface alone I barely ever look though my chat list. I can access all my contacts and practically any functionality I need right from the search box. With just these few resources to get you started, it shouldn’t take long to adapt to the Google Contacts system. There is widespread support for importing contacts from a third-party application, plus a ton of interconnectivity. Google+ also has opened a new chapter for users of their chat and email services. If you have been looking to clean up your Google Contacts, it’ll just take a bit of patience and perseverance. Getting organized feels great, and Google offers you the tools to make it happen. Users of the Google Chat IM client will also feel relieved with such straightforward access to organizing the contacts of their buddies. If you have ideas or similar suggestions for managing contacts in Google please share with us in the post discussion area below.